The fourth of Team GATV's winter hiatus roundtable discussions looks ahead to the rest of season 1 of the CW's Arrow. With a thriving viewership and fanbase, Arrow made a strong case to take the award for Best New TV Drama at this year’s People’s Choice Awards. Yet, while that vote came up short with the series losing out to fellow freshman series and network-mate Beauty and the Beast, it’s still the most popular and watched show on its network this season. At just nine episodes in, the breakneck pace of the series has given us a number of tantalizing story threads and plot points to chew on, as well as introducing us to a large assortment of characters that live within Oliver Queen’s orbit. Finishing the table setting in the excellent midseason finale “Year’s End,” a healthy menu of 14 episodes awaits in which to feast and gorge ourselves on the season’s mysteries, relationships, philosophies of justice, and guest villains. 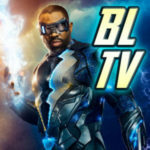 With the show on winter hiatus, the GATV staff decided to offer some insight and reflection on the CW’s hit over the past few weeks. As the show roars back with next Wednesday’s “Burned,” we hope we able to entertain, enlighten and tide you over, as well as kick off some discussion of you won. For this final week, we offer some expectations as the series jumps right back into high gear coming out of the break, some hopes and desires for plotlines and characters as the season marches on, and some final thoughts on this first year in the escapades of the Emerald Archer! WHAT ARE YOUR EXPECTATIONS FOR THIS RUN OF 3 OR 4 EPISODES COMING BACK OUT OF THE HIATUS? CRAIG (Webmaster/Editor-In-Chief): I’m very excited to see Deathstroke again, though I forget which episode that’s coming in. Just as well; I can be surprised. Seth Gabel as not-Count Vertigo should also be fun, I like him a lot, though I hope it’s not another Thea drug story. I have a feeling there are some more surprises in store that we have no idea about yet. 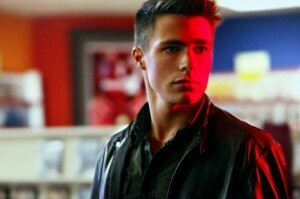 I’m also excited to see what Colton Haynes brings to the table as Roy Harper. Teen Wolf was and is one of my favorite “guilty pleasure” shows, and I wonder if some of that fandom will come over to Arrow now. I also saw on Twitter that Annie Ilonzeh’s Joanna gets something to do in “Burned,” which makes me happy and answers one of my wishes from a previous roundtable. MATT (Writer/Reviewer): Nice to see them expanding even more of the supporting cast. I’ve been doing a rewatch of The West Wing on Netflix Instant — even though I have the complete series on DVD — and I’m always struck about how they filled out the world on that show and made significant parts for even the most minor of supporting characters. I’d love to see some thought spent on fleshing out this world in a similar fashion. STEPHANIE (Writer/Episode Guide Archivist): I’m interested in seeing how the show changes and evolves over the course of the next few episodes and how the characters develop. I would love for them to flesh out the characters more. We’ve been seeing quite a bit of Oliver’s list mission, so balancing out characters with story would be nice. Don’t get me wrong, the story has its appeal, but I think it could be strengthened in this way. DEREK (Writer/Reviewer): I’m very excited about Seth Gabel. It sounds like he’ll be used a little more than Deadshot and China White from how they’d talked him up, but even with minimal material, he has enough charisma to be memorable. And I’m way more invested in this secret society arc than before now that the Dark Archer has made his appearance. MATT: I’m really interested in the effect that Merlyn’s beat down of Oliver had on him. From what we know of next week’s episode, the “vigilante” has not put in an appearance for six weeks. (Nice little time match with the real time hiatus.) I’m guessing Ollie is recuperating, but it also sounds like he’s going to be questioning his ability. I have an expectation they’ll deal with that in one episode, but I’m kind of hoping it’s a nagging thing for a few episodes. CRAIG: If this was Buffy, there’d be a joke about him being unable to perform. 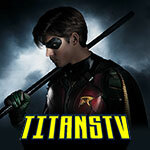 ANDY (Writer for sister site KSiteTV.com): Well there are some really exciting episodes coming. We have the episode “Burned” featuring the Batman villain Firefly, which will be interesting to see their take will on that character. I’m looking forward to discovering more about Diggle’s past with the introduction of Ted Gaynor, played by [Farscape‘s & Stargate SG-1‘s] Ben Browder. I’m definitely psyched about the introduction of Seth Gabel’s Count; I think we are in for a great treat. 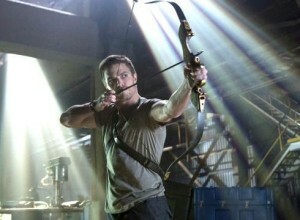 But the thing that I’m most excited about is the introduction of one of my favorite Green Arrow characters, Roy Harper. DEREK: I like the idea of Oliver losing his confidence a bit. Something that’s kinda bugged me is that, even though he’s certainly grown, we’ve only seen snippits of him really, consciously questioning his motives. Usually, he reluctantly does something different because Diggle eggs him on, but he’s still smug about his Arrow persona when his way works. The most interesting stuff for Oliver thus far has been when he actually admits his own weakness or really fails — probably the best part of the Huntress arc — so it’ll be nice to see those consequences resonate. He’s got to question himself a little bit because he’s not always right. ANDY: That was the thing that I enjoyed with “Year’s End.” We got to see Oliver getting defeated and I think that will make the character more interesting, to see him have flaws and being a bit unsure of himself at certain points. STEPHANIE: To echo that, I would like to see Oliver actually encounter a difficult problem and be brought down a little bit. I think in order to build up his character, he has to also be broken down. Not to the extreme drunken gutter nights I imagine Smallville’s Green Arrow experienced, but more in the sense that Oliver needs a reality check. ANDY: Oh dear God, he better not reach that level. That story went on forever. When I think of reality checks for Oliver, I think of the voices of reason that Diggle and Thea offer him. WHICH GUEST STAR/VILLAIN/HERO ARE YOU MOST ANTICIPATING THIS SEASON? ANDY: Are we talking about only the ones that are about to show up or does it include previous guest stars as well? MATT: I’d say ones coming up, as we’ve talked previously about other guest stars. ANDY: As of now, the only new “hero” guest star that we know of is Roy Harper, but that all depends, since it isn’t clear yet what role [announced guest character] Shado will play. I’m definitely looking forward to seeing Roy the most. Colton Haynes looks the part and, with all the great casting work that Arrow has done so far, I’m sure he will be a favorite. I know there are a lot excited about his introduction. There is also a group who are complaining that it’s too early for this character to be brought onto the show, just like those who complained when Lois Lane was introduced in the 4th season of Smallville. CRAIG: I have no problem with Roy coming in so “early.” As far as I know, Speedy first appeared in the same comic that introduced Green Arrow. He’s always been a part of the story. MATT: To the [comic-reading] audience, Speedy appeared at the same time as GA, but in the narrative chronology, Oliver had been GA for a bit before he took on Roy. It sounds like, for the show, they’re introducing the character to the world rather than his hero persona. From that standpoint, it doesn’t seem early. ANDY: I don’t think it’s too early either. From what we know, he’ll be a love interest for Thea and he’s “destined to become a huge player in the Arrow universe.” I think that is acceptable and doesn’t make it early at all. In fact, I think the reason why they are bringing in so many of the well-known Green Arrow characters is to set up this universe at an early point and build from this first season. CRAIG: I do wish they’d wait on Shado until Maggie Q is available. Simply because I can’t picture a better casting there. ANDY: That would be cool, indeed! I agree [about Roy]. However, if they make him Speedy/Red Arrow this season, I think that would be too early. CRAIG: I’d kind of like for him to be Speedy already. To have some punk kid trying to be an Arrow with a different approach could be interesting in the same way Huntress had her interesting moments. Oliver can learn from those types of situations. ANDY: I’m open to that idea. MATT: I’m torn with that. I kind of want to see bigger effects of Oliver’s campaign as Arrow before we start seeing “copycats.” Since the Hood isn’t known quite yet as a crimefighter beyond someone targeting the rich, I think there are still things to establish before others arrive to draw focus. CRAIG: I do wonder, if Roy goes over well, if Colton Haynes will be a series regular for Season 2 and beyond. The cast is already pretty big, but Roy would add a lot to the dynamic, I’m sure. Plus, The CW does like their young pretty people, and Colton has a big following. STEPHANIE: I am excited for Seth Gabel. I loved him on Fringe, so seeing him tackle another role will be fun. Gabel is probably the most exciting casting announcement I’ve heard in a while. DEREK: I honestly wouldn’t care much about a Count Vertigo appearance if it wasn’t Gabel. 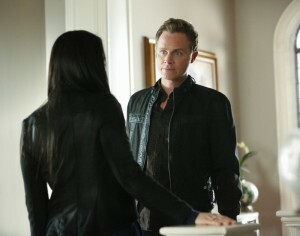 Same goes for David Anders’ character, Cyrus Vanch. A lot like how I like the main actors in the roles more than the characters — like we discussed last time — I think I’m more intrigued by the casting choices coming up than the actual characters. But that might have to do with having unfamiliarity with some of these characters. STEPHANIE: I almost forgot about Anders coming in. He does so well as the unsuspected semi-villain and has played several interesting characters on shows I’ve watched: Alias, Heroes, The Vampire Diaries, and Once Upon a Time, so I’d almost expect his arc to be great. MATT: Like I mentioned before, I have nothing but high praise for the casting agents working the series. They are doing outstanding work. I’d agree that I’m definitely hyped more by the actors than the particular characters at this point. Take James Callis for one. I have no feelings one way or the other for “the Dodger,” but I’m interested to see Callis on the show. DEREK: Oh yeah, I forgot about Callis! I’m excited for that one too. CRAIG: At this time, I’m probably looking forward to Roy Harper the most, though I have a feeling they’re going to surprise us with something even bigger. So many of the announcements for the show so far – like John Barrowman or the Huntress – no one had seen coming. MATT: If you had to guess, what would you think would be something they could possibly surprise us with this season? CRAIG: I think anything is possible with this show. I know we’ve discussed before who we’d like to see; I’m sure we’ll get some of those, and possibly some we would have never seen coming. We’ll get a “The Riddler to show up” headline or something crazy like that. ANDY: Surprises, surprises… It’s a tough one because they’ve introduced/will be introducing some of the big players from the Green Arrow mythology. Maybe it’s just me who hasn’t a grasp on the entire GA universe. Something I forgot to mention was the coming appearances by Manu Bennett as Slade Wilson. Since he won’t be some old man from Battlestar Galactica, I’m more psyched to see a more iconic/closer portrayal to the character from the comics. MATT: No disrespect to Michael Hogan, though. Terrific actor. I love Manu Bennett on Spartacus, so I’m excited to see his unmasking for Deathstroke. Really hoping they do complex things with his character rather than just making him a one-note villain. I think I’m fairly excited for Gabel, too. Though they’ve really torn apart the character of Count Vertigo for his introduction on the show, I find myself alternately intrigued and horrified by what they’re doing. Vertigo is the drug this guy is pedaling and “the Count” is a street moniker rather than any sort of foreign royalty. Could be atrociously bad but there’s the potential to really invent a compelling and disturbing character for the series. A signature villain for the show, even based on a pre-existing one, would be a great thing. In that instance, I’m really keyed into seeing what they do with the character and not just the actor they’ve brought in. ANDY: I’m not sure how to feel about the not Count Vertigo thing, I think it’s a creative move of them to re-shape a character like that, so I’m just going to wait and see and hopefully enjoy the ride. CRAIG: Hey, at least originally, Smallville would do “their version” of characters, like the Flash, and it worked out really well. So I think to do a more grounded Count could be interesting. Cheesy would have been if his name was Count Vertigeaux or something. DEREK: I liked the season 4-5 reinterpretations of DC characters better than the more straight-from-the-page ways they were used in 9-10, with some choice selections. MATT: It depended. I thought the reinterpretations worked for the show that Smallville was at the time. The more comic-based characters that appeared in seasons 8-10 fit the change in the show. Like, I thought they absolutely nailed Booster Gold in season 10. Perfect casting, great writing on Geoff Johns’ part, and he was used well for Clark’s story. Unlike the awful Blue Beetle mess from the same episode. DEREK: That’s fair. Can’t argue with Booster Gold. But there’s other things like Silver Banshee, who could have easily been reimagined as something very cool, but her actual form ended up looking pretty laughable. Though, I can’t fault them for the attempt, I guess. Smallville kind of became an experimental “DC Comics in Live Action” show in its later days, which is interesting. MATT: It did. That was something I kind of appreciated about it. 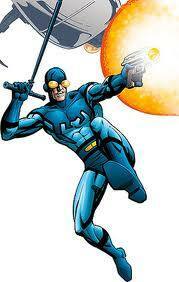 CRAIG: [Speaking of Blue Beetle], I’d love to see Ted Kord on Arrow. And, if Andrew Kreisberg gets to do his Booster Gold show, let’s see the same actor playing Ted there for a wink-wink-nudge-nudge same universe kind of hint. WHAT ESTABLISHED STORYLINE ARE YOU LOOKING FORWARD TO THE MOST? DEREK: The Tempest group is still an intriguing aspect to me. I think part of it is because I’m confident that this will be more-or-less solved by the end of the season, and would thus mean we can close the book on the list and some of the more plot device-y things that only worked because it was early in the show. ANDY: It’s hard for me to pick just one with storylines like the Tempest group and Malcolm Merlyn’s big plans, Oliver’s progression as a hero/crime-fighter and work on his relationships with his family members, friends like Tommy and Laurel. Moira is in hot water right now and I’m really looking forward to see how she will get out of it. I’m cheering for her to get out of it because she is such a complex and wonderful character. MATT: For me, I’d say I’m kind of most looking forward to the building of Oliver’s team. I don’t think Diggle will be the last and I expect to see at least one other member this season. Personally, I think they’ll bring Felicity Smoak in on the gig. Obviously, there are the set-ups with Roy and with Laurel, as well. They need at least one or two other voices in the team to bounce the ideas of vigilante justice. ANDY: It would be nice if it’s one of the female characters, so it won’t just be a boys team. I think it will be Felicity, who I think already knows that Oliver has something to do with the Hood. DEREK: More female voices [on the show as a whole] would be useful. We’ve got plenty of potentially strong ones but they can all be used a little better. STEPHANIE: Yes, clean up the reckless and helpless and manipulative females … or multiply Felicity Smoak. There are options. ANDY: Multiply Felicity, that would be something! She is Arrow‘s Oracle, period. MATT: I don’t care for Felicity being Oracle-like, though. Not in that grand-old-omniscient sense. CRAIG: She already is able to do a bit too much as it is. MATT: I like her fulfilling the tech role — and the humor role — but I’d love for her to have limitations. Still, she’s the kind who knows how to get things done. CRAIG: I know we keep going back to Smallville, but it’s like with Chloe Sullivan. I liked her a lot more when she was a regular girl who was really smart and really inquisitive. Once she was like a super-Oracle, I think she lost a bit of what made her special. To me, at least. I loved old school Chloe. MATT: Exactly. If Felicity has to become a know-it-all, I’d like to see them have her learn it on the show rather than just lightswitching it. That would be a far better backbone arc for the character. See her become proficient rather than just using her as a writing crutch. ANDY: Does anyone feel like me that she kind of knows Oliver’s secret or knows that he has something to do with the Hood guy? MATT: I think she knows. CRAIG: If Felicity has no clue, she might be “galactically stupid.” I don’t know how she could be so proficient in … everything yet not see through Oliver’s BS. ANDY: I imagine there are deleted scenes of her laughing every time Oliver leaves her after his excuses/stories. STEPHANIE: Felicity definitely has an inkling. I want to see her interact directly with The Hood. That could be fun. ANDY: I can see her say exact that line. MATT: Have her hear right through Oliver’s voice manipulator. That would be kind of funny, actually. STEPHANIE: I’ve mentioned it before, but I’m invested in what Walter is doing and seeing how all the Tempest secrets blow up or don’t. Right now, it seems like many of the characters are doing their separate things and interacting not because of those things but for other reasons. Maybe these answers will create a more unified show where the characters can still have their own stories but also not be so awkward around one another. Additionally, I agree with Andy. Laurel needs something to do besides the love interest drama. ANDY: What she really needs is a pair of fishnets! CRAIG: The storyline I’m looking forward to the most is Laurel’s mother. Where did she go? Does she look good in fishnets? Does she look like Julie Benz? Is she aware that her husband practices magic? Things like that. Well … maybe not that last part. WHAT STORYLINE ARE YOU LOOKING FORWARD TO THE LEAST? CRAIG: I hate to say it, but unless they do it really, really well, I’m not all that thrilled for a Huntress return yet. Also, any romantic triangle mess can stay far away. ANDY: It’s the CW. Good luck getting that. I’m actually hoping that Huntress will return and that they will follow up on her story. MATT: I kinda hope Helena doesn’t return till next season at the earliest. That doesn’t feel like a storyline they need to pursue at the moment. DEREK: Yeah, I think Huntress would work better developing a bit offscreen. If she returns next season and is written and/or acted better, it’ll make sense. Now is too early. ANDY: I feel a disturbance in the Force. Show some love for Helena! [laughs] Maybe at least one more episode would be acceptable. CRAIG: Eh, I’m sure it will happen. I just would prefer it to be a long time away. With no offense to Jessica de Gouw, who is lovely, I just think Huntress equals more relationship drama and over-the-top stuff that I’m not in the mood for. I have a feeling, though, that she’ll be back sooner rather than later. ANDY: I need to read that on-set interview you had with her, Craig, to see if that question even came up. Switching gears, the Laurel and Tommy relationship. Don’t get me wrong. I like it and I’m only saying this because I think they have worked so much on it. They need to get individual storylines, though, Laurel especially. 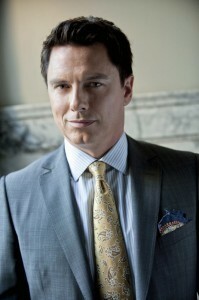 I really want to see Colin’s Tommy have more scenes with John Barrowman’s Malcolm. They should work on that storyline. STEPHANIE: I don’t want Thea to continue calling out Oliver on his lies or lecturing him on how to live his life. It will get old quickly, à la Lana Lang on Smallville. ANDY: I think “Year’s End” was a pretty good sign that she won’t be. At least, not for a long time. I wouldn’t actually mind seeing some Thea in school. Maybe that is something we might get with Roy coming in. MATT: What I’m looking forward to the least is tempered oddly by wanting to see more of it, if done right. That’s the island flashbacks. Right now, the story doesn’t engage me much. And the fact that, as we mentioned before, they’ve had a rough go of attaching the flashbacks in meaningful ways to the present narrative, it makes it a bit of a slog. Still, I want to know what happened. And I want it to blow me away. DEREK: I agree about the island flashbacks. I haven’t hated them, but I’ve been pretty “meh” about them. Episodes without them don’t feel like they’re missing anything. 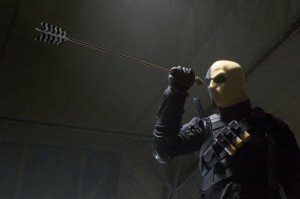 CRAIG: I did think the island flashbacks with Deathstroke were really powerful, though. ANDY: Visually, they are a lot of fun to look at but they have lost some effect, recently. CRAIG: In the pilot, especially, it looked right out of the comics, which gave me huge grins. I was recently reading a reprint of Green Arrow’s origin by Jack Kirby in the late 1950’s. I was impressed to see elements from that story — especially visually — ended up on-screen, particularly the swimming to shore and cave moments. I like that a lot. MATT: It doesn’t feel like they have a solid story behind it yet. Like they’ve created each flashback independently while loosely connecting them. CRAIG: Maybe if we see the island enough, we’ll see Eddie Fyers growing his mustache. It’s gotta be November there sometime. ANDY: They have lost the sense of time and date. They have no idea what day it even is there. CRAIG: The Professor can make a radio out of coconuts so they know when it is. MATT: Well, plus, Fyers and his gang aren’t really trapped on the island are they? I get the impression they have all sorts of amenities, including coconut clocks. STEPHANIE: I wouldn’t be opposed to some sort of training montage on the island. Considering it forged Oliver into a weapon, that should be included. CRAIG: Would there be a salmon ladder involved? STEPHANIE: If I was writing it, of course there would be, perhaps made out of bamboo. 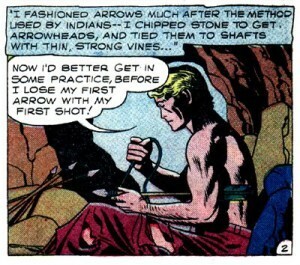 Not that I’ve thought about it… [laughs] But more so I would like to see his archery skills in the making. ANDY: I think his training will start popping up a lot more when Manu enters the show. MATT: That would make sense. That would tie into what he’s become. ANDY: I think it has been well established that Deathstroke will have some role with forging Oliver into this weapon. MATT: I know they’re building up to it, which is why I’m still interested in knowing. I’m just not looking forward to it as is because I don’t find it has much heft or life but for a few scenes. CRAIG: Maybe when Walter escapes he can escape with a ladder…. a Colin Salmon ladder. MATT: You’ve been keeping that one in the back pocket, haven’t you? CRAIG: For like FIVE MONTHS. No shame. 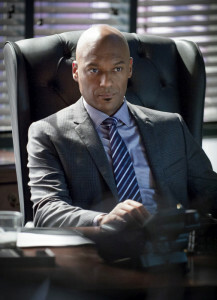 A Colin Salmon ladder has an awesome accent and is smarter than every other ladder in the building. Oh, and it can dance. 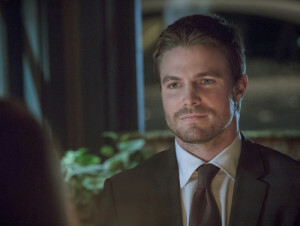 HOW DO YOU SEE OLIVER’S STORY MOVING FORWARD THIS SEASON? CRAIG: I keep saying — or at least hoping — that he’ll lighten up with time. He’s still adjusting. But that’s where I hope it will go. Preferably a date with Felicity Smoak at some point, too. Even if that borders on relationship drama. STEPHANIE: I see Oliver figuring out how to fight corruption by his own means and doing what he thinks is right and not going strictly on what his father told him, especially since the list was created by someone else. DEREK: I’d like Diggle’s influence to lead to him being more of a hero than vigilante. He still hasn’t reached that point yet where he’ll do heroic acts that don’t move his mission forward somehow. It’s important for his sake — and ours, as viewers, to keep us liking him — to actually help people without it being part of some convoluted “righting father’s wrongs” methodology, or just because he’s a good guy doing good things. That needs to happen by the end of this season, I think. ANDY: I think it has to get a few steps forward, at least. I don’t think he will have reached that point completely by the end of the season. That is a overall arc for the series, at least in my perspective. MATT: I have a feeling, like Derek mentioned [in one of our earlier roundtables], that we’re seeing that progression. When we turn around and look at the whole season, either at the end of the year or in 2 or 3 years, we’re going to see Oliver dealing with his trauma and growing out of that into a lighter but still committed person. ANDY: I feel that in a realistic way, recovering from the trauma that he went through, it’s a process of getting to a bright point like that. So taking steps, like spending time with his family and reconnecting, that is what will take him to that point. It’s a long process and that is something that I feel we will get to see in the 2nd run of the season. MATT: I think, looking back, that will all make sense. We’re just having to live through the “getting through” right now. DEREK: Yeah. There’s already been a progression here, but it’s subtle. I imagine when we open season 2 we might see a different kind of character entirely, depending on what happens. He’ll only make sense — or at least, will be fulfilling to see — with the knowledge of season 1’s journey. CRAIG: It’s interesting, and I hope Arrow doesn’t do this with Oliver and Roy, but I’m seeing Dark Knight parallels here, too. I don’t think I ever “liked” Christian Bale’s Batman or saw him as a hero, but John Blake was instantly that. For TV, though, such a tactic could be harmful since Oliver is the character we signed up for. It’d be unfortunate because I know Stephen Amell can do fun and not-brooding. I also think a scrappier, lighter Oliver might appeal to young women — and probably some guys — more, too. 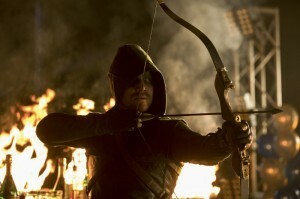 STEPHANIE: Thea being put in the line of fire would impact Oliver, which would mean a villain finds out his identity. It has to happen at some point, right? WHICH CHARACTER — OUTSIDE OF OLIVER — DO YOU EXPECT TO HAVE THE MOST GROWTH IN THIS LATTER PART OF THE SEASON? ANDY: I think a lot of the female characters, will have grown a lot in the 2nd half, especially Laurel, who I really hope will grow a lot because I do care for the character quite a bit. Thea and Moira are on their way but haven’t grown much. I do think they will as the story progresses. STEPHANIE: Moira, because I imagine that the whole Walter went missing dilemma will give her more screen time and cause her to evaluate her allegiances with various people – Malcolm Merlyn, Oliver, Walter. CRAIG: I’d like to see growth in many of them, but I think the best material or possible growth, I’d have to agree with Stephanie in saying Moira. DEREK: Yeah, Moira has the most potential. Tommy, maybe, depending on how soon his dad is unmasked. I HOPE Laurel gets material and development. MATT: Tommy is my pick. I think they definitely expand upon the Merlyn family dynamic and the two men involved. Diggle would be my sentimental pick just because I think he’s the most fully realized character and I would like to see him given more room to breathe and exist. STEPHANIE: I hope she puts herself together. Realistically, she will probably develop a love interest and stir up more mother-daughter and brother-sister drama. CRAIG: I think Thea will continue to do the drug/annoying thing. Roy might break her out of it, which, of course, would have some irony to it. I also think Thea will be one of the first to learn Oliver’s secret. ANDY: I think she will be re-developing her relationship with her big brother, starting this (hopefully) wonderful relationship with Mr. Harper. I have to agree that some drug stories will be coming up for her. It would be quite ironic — or poetic might be the better term — if Roy would be the one to help her get out of that problem. MATT: It seems like a foregone conclusion that Thea is going to go through a harsher drug storyline. While it would be interesting to see Roy be the one to pull her out of it, I almost have a feeling that he’s going to be the one that introduces her to that storyline. Then, part of his arc will be the redemption from that act. DEREK: Yeah, I’m assuming she’ll be the next to be in the know. She’s already on his trail, which I like. I wonder if Roy Harper might actually be a bad influence, like Matt suggested. I think her figuring out Oliver’s identity — or having it reaffirmed — will be what pulls her into a better place. ANDY: Maybe that is what they meant when it was announced that Roy would join the show and meet Thea in a “unexpected” way. CRAIG: I’d like to see more explanation for why his father just cut him off. I still think he might be the most difficult character to build, because he was initially established as such scum. But Colin Donnell has charisma, so we’ll see. ANDY: He will break out into a singing career. 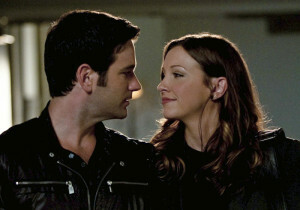 Seriously, can we please have Colin Donnell singing on the show. He has an amazing singing voice. CRAIG: I don’t really know that singing has a place on Arrow. CRAIG: I really think that would totally take me out of an episode. With that said, if Colin separately releases an album, I’d buy it. ANDY: Listen to “It’s De-Lovely” from the musical Anything Goes. He is amazing on that song. STEPHANIE: He’ll continue to woo Laurel and refuse to accept that he has no money anymore. I’m hoping for a good scene with his father to further establish their relationship. That reveal came out of nowhere. ANDY: I want to see Tommy deal with his father and get some more backstory, perhaps some background on his mother. 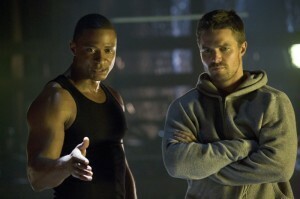 I hope to see his relationship with Oliver progress some because they are best friends after all. MATT: I have a feeling we’re going to see Tommy go down that oft-treaded TV road where the guy who grew up with money then suddenly has none gets mixed up with the best of intentions with criminals. I think it might end up having something to do with the club, as well. Also, trying to balance his relationship with the virtuous Laurel against that. CRAIG: I think that might make him more unsympathetic though, which I don’t really want. MATT: Depends on how they tell it. If it’s more him getting in over his head rather than “turning” to crime, you could keep some sympathy. DEREK: I think Laurel will be his major focus, for a while, until his father is presumably unmasked at the end of the season. Or, alternatively, they’ll continue the Osborn comparisons. Have him not be in the know and, by the end of the season, Oliver does and his father might (seemingly) die, leaving tension between the friends for season 2. Or something along those lines. It’s potentially meaty stuff. ANDY: He will reveal a lot more of his character, why he is the way he is and how he got into the Tempest group. I think he’ll be starting something with Oliver, or have some sort of interest in him. 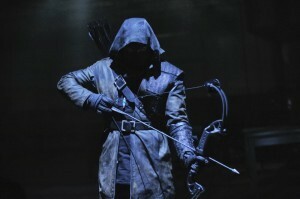 Also, his alter ego as the Dark Archer will also be much more explored. STEPHANIE: He’ll continue to me mysterious and ominous for a little while, but with more scenes and arrows. I’d love for him to develop a distinct personality. CRAIG: I think Malcolm will continue to be a thorn in people’s sides, especially Moira, Tommy, and Oliver. I think he’ll get even scarier as the season goes on. It’ll build. MATT: Will Malcolm be revealed as the Big Bad or is he working for someone? ANDY: I think it would be a really surprising twist if he is working for someone. CRAIG: Maybe he is the Big Bad. ANDY: The show-runners has sure been keeping that aspect a big mystery still. DEREK: I’d like to see more revealed about him and get some motive behind his madness. I could also see him spun out as a less-complex Ozymandias [from Watchmen] kind of villain that’s just doing his plan because he believes that’s what’s best, despite the means. That might not be a bad thing for the show’s first season. Buffy’s first Big Bad was The Master, who was insanely two-dimensional, but it worked in its favor because that season was an introduction to the concept. CRAIG: I’d like to see her develop a personality that is not defined by CNRI or being a love interest. I don’t think she’ll be the Black Canary for a while yet. Guess it would be kind of backwards development for her to open a Sherwood Florist shop, though, eh? ANDY: She will start to become more of her own character, not just connected with Tommy. I think she will be making some breakthroughs in her career work and even start to rebuild her friendship with Oliver, piece by piece. I would really love to see her having some big changes in her character if her mother shows up. Not 100% because of her mother. It would be nice if it’s through her own ways. 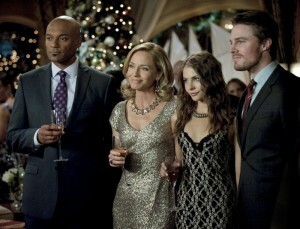 STEPHANIE: I hope Laurel re-examines her relationship with Oliver and The Hood. Not for the romantic relationship, but for her not going in circles with her emotions. MATT: At this point, I find some enjoyment in her and Tommy together. And I see only her mother coming back into the picture as being something that would spark life and personality in the character. Otherwise, frankly, I don’t see much doing for Laurel for the rest of the season. She’ll be included but I don’t see anything substantial for the character for the rest of the year. DEREK: I wouldn’t be surprised if we don’t see her more fully developed for a while, sad as it is to say. There’s enough meat to chew from all the bigger players doing their things that Laurel’s problems play as kind of trite in comparison. I could see them bringing in her mom and using that as a big push into her arc. ANDY: With some blasts from his past returning, I think he will be affected mentally by it and it will be bothering him. CRAIG: We already know that we’ll be seeing more of his backstory soon. I’d enjoy seeing more of him with his sister in law. Right now, in some ways, he kind of is “the good guy of the story” – the moral center that Oliver can learn a lot from. STEPHANIE: Diggle will most likely keep passing judgement on Oliver and influencing him. It would be cool to see his hand-to-hand combat skills more closely instead of him just being the instructor to Oliver. Also, I want to see him have a personal reason to to team up with Oliver against criminals- now he almost seems to act out of obligation to keep Oliver alive and from killing. MATT: Yeah, I would like to see something with Deadshot that causes Diggle to go out in the field in some capacity. He doesn’t necessarily need his own costume/alt identity, but something that has him out there and not just hanging at the base. I think developing the relationship with his sister-in-law and bringing in his nephew are things we’ll likely see as the season goes on. DEREK: I don’t mind him being the backdrop and voice of reason for a while longer without being in on the action as much. I’d like it to be the kind of thing where, yeah, we know he’s a good combatant, but the moments we see it are so far and few between that it makes them that much cooler. ANDY: Hopefully, surviving this season. There is so much story within this character and so much that they can do, plus I do enjoy seeing him investigating and I wouldn’t actually mind if he along with Oliver would discover the mystery. Plus, more Felicity and Walter scenes! STEPHANIE: Walter needs to assert some power and stop being undermined by his wife and her associates. And find answers. Exploring his relationship with Oliver would be interesting. CRAIG: I hope we see Walter back very soon. I’m, again, happy that his character wasn’t a predictable villain. He seems like a good guy. DEREK: It’ll be nice for him to not be away or kidnapped, for one. But I have a feeling he’ll be gone for the majority of the season and be used as more of a chess piece, or a device to get Moira doing more. Though, that’s not a bad thing, giving Moira stuff to do. MATT: I think he’ll be gone for the majority of the season, as well, which is unfortunate. It would’ve been nice to see him exploring into Tempest further before he got taken. He has a great presence and his inquisitive side was one of the more natural character traits on the show. Something big will happen with he or his wife that will alter him (or kill him). ANDY: She will be struggling a lot with Malcolm and keeping this mystery from her family but I believe that at some point, she will get the upper hand. As a mother, I think she will be in a way getting closer with Oliver which we have already started seeing, back in the first run of the season. CRAIG: I think she’s going to be pushed into very uncomfortable places. Malcolm will try to send her to the edge, and it won’t be pretty. 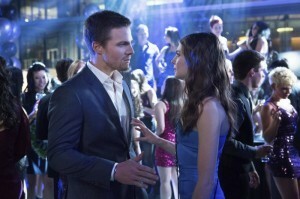 STEPHANIE: I imagine Moira will become more suspicious of Oliver and try to fight back against Malcolm. MATT: I think she’s definitely going to run up against competing interests of the group and her family and I think what’s going to happen is she’s going to be forced into a situation where she goes against the group with dangerous consequences. DEREK: I wouldn’t be surprised (or mind) if she goes along with Malcolm’s plans for a while, but works behind his back for her own machinations, to get Walter back and protect her family. I think, now that she’s been pushed to that uncomfortable place, she’s going to stop being a fish flopping around on dry land and start gathering her bearings. She’s smart, so I don’t think she’s going to let herself continue to be a victim. The Walter kidnapping ought to be the turning point for her to fight back, not lay back and accept it. WHO DO YOU THINK OR EXPECT WILL BE TRIMMED FROM THE CAST, IF AT ALL? CRAIG: I think we’ll lose at least two before Season 2. Not sure who, though. ANDY: I think it will be one of the guest recurring stars and one of the main stars. DEREK: Cliche as it sounds, a major character death at this point would be crazy. I’m sure we expect death at some point, but the show has done a nice job at interweaving all the characters in such a way that any demise would profoundly change things for just about everyone, in some way. Now, I don’t really want any of these characters to die — I think there’s plenty more to do with them for a while — but there are story possibilities there beyond just the shock factor, which I like. STEPHANIE: Detective Lance would by my first guess. Have we mentioned him at all during this conversation? His relationship with Laurel was interesting in the beginning, but there is only so much you can do with that, and also with him as a detective or else he’ll get boring. But I think [a character death] now is too soon and it wouldn’t be effective enough. Joss Whedon is one of my favorite television creators and he has a way of making character deaths impactful. If Arrow does decide to kill someone off, especially someone close to the hero, they need to make it strong. ANDY: Since I have been watching Torchwood so much recently, I’m not ready for any character deaths in any show at the moment. I hope that we won’t lose any of our beloved characters any time soon. Problem is, that is probably going to be the case as we get closer to the end of the season. CRAIG: I’ve said it before, though… I do think character death might have a place for Arrow, even if it’s someone we like. There are so many characters to juggle right now. MATT: It’s tough for me to think of a character death, though the possibilities of Moira or Malcolm biting it are certainly being set-up. I could see them dropping people rather than killing characters off, though. DEREK: I actually don’t expect to lose our regulars until season 2. Just thinking of similar shows we’ve compared it to, like Nikita for example, it took until season 2 at least before the main cast was cut down. As for recurring characters, unfortunately, I’m not sure I see much of Walter’s function once the Tempest arc is closed, so we might see his demise. He’s really the only prominent character that comes to mind, though. Maybe Detective Lance, but I hope he sticks around for a while. STEPHANIE: Pre-Oliver-on-the-island flashbacks are on my wish list. We know he was a charmer and such, but actually seeing it would add some dimension to his character, and it’s no doubt that Stephen Amell can pull it off. ANDY: I’m just looking forward to a great and magnificent second run of the first season. A good number of new characters coming which I’m looking forward to see the Arrow take on, as well as some return of some good old favorites. I’m generally looking forward to see the progression of these fascinating characters, especially the main hero himself, Oliver. CRAIG: I actually am not sure what to expect, and I mean that in a good way. I have a feeling some surprises are in store, but what they are … I don’t know. I know that’s such a non-answer. I’m feeling good about it, though. DEREK: I’m still sort of half-hanging on to the wacky theory that Tempest’s final solution involves them gaining immortality or superpowers or something, to add an organic-yet-big way to insert the more fantastical aspects of the DC universe. But I wouldn’t be disappointed if they kept it grounded in reality from here on out, either. Now that Dark Archer has been introduced, I feel like the show is starting to really feel like a colorful comic book-based show, and I like that. So I hope it uses that to its advantage and forges its own identity. MATT: For me, I just need to state that for the criticism we all levy on the series, I’m enjoying it and enjoy having it around. Don’t want readers to think we aren’t fans and aren’t pulling for it. I like that as a genre show, it seems to be getting mainstream respect and recognition. As for the season, I’m a bit in Craig’s boat in that I’m really finding it hard to predict anything with the way the show is run. I think we will get past the list trope this season and there will be a reveal and showdown between Malcolm and Oliver. That will spin into a much larger threat that is the Tempest Group or that the Tempest Group is just a mere part of, much like when Sydney Bristow found out just how small SD-6 was in the scheme of a larger world conspiracy on Alias. I’m looking forward to being blown away. That’s going to do it for our winter hiatus roundtable series. Hope you enjoyed it as much as we did discussing it. Next Wednesday, January 16, the show returns and we look forward to seeing if any of our predictions ring true. If you missed any of the previous three parts of the series, scroll back to the top for links. Keep tuned to GreenArrowTV for news, reviews, interviews and more insight, er, …ews. Team GATV appreciates you spending some time with us. As always, feel free to share with us any questions, requests, or insights of you own in the comments section below. You’re also all welcomed to throw in your Arrow thoughts on our Arrow forum!